A loooong day of travel that started yesterday mid-morning with a two hour drive to the airport, and several travel glitches, but we are here! Already, have had a couple neat blessings. The trip is long, and we had a couple layovers. A change in the Miami connection turned the 1.5 hour layover we originally scheduled into 4 hours of sitting, but no real hassle. The Madrid layover was a bit more interesting… The Israeli security screening team was no joke. One member of our small party was pulled into a room to be searched, all her belonging were searched and she was questioned for about 30 minutes as passengers were boarding… That was interesting and called for some prayer. Sure enough. He had just finished with a tour group and was looking for a taxi to ride home in. We got out, exchanged surprised greetings and plans for tomorrow’s meeting in Jerusalem, then he hopped into the cab and headed home while we checked in! This city is huge with hundreds of thousands of people and we bump into Hanoch right off the bat! Immediately after checking in we quickly donned shorts and flops so we could rush the block and a half to the beach before all light was gone. Tonight is Rosh Chodesh and it feels like a new beginning! We wandered a short section and dipped our toes into the Mediterranean. Simply, beautiful. Food was foremost on our minds, so we reluctantly left the beach to follow directions to a nearby restaurant the hotel’s proprietor had recommended. WOW! 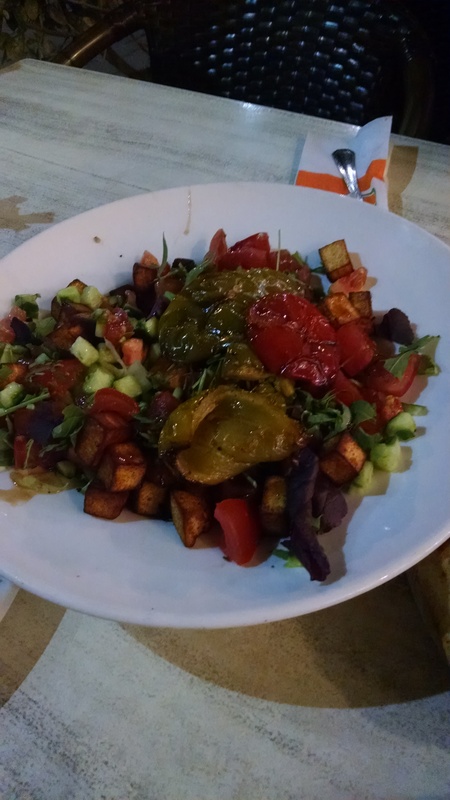 Between the three of us, we ordered a salad, pictured at right, an antipasta and some spicy homestyle potatoes. The food was so good and the atmosphere with the cool breeze blowing into the patio area off the sea… heavenly. We relaxed and agreed that if we had to fly out tomorrow, the trip would have been worth it!! Resting tonight and hit the trail early tomorrow for Jerusalem and Hezekiah’s Tunnel as well as parts of the Old City. Blessings. Getting some rest before tomorrow! 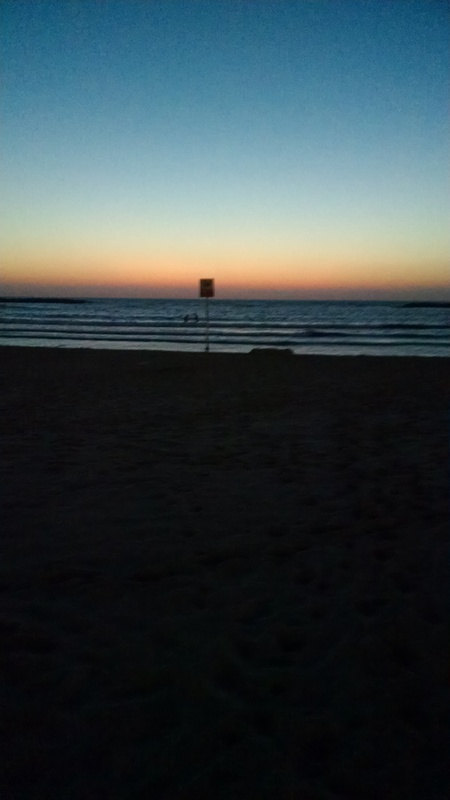 This entry was posted in A Thought... and tagged beach, Hanoch Young, Mediterranean Sea, seaside restaurant, tel aviv, travel. Bookmark the permalink. I want to hear about everything. Can’t wait!! Pete, we are so glad you and Kelly made it safely my brother! Soak in this life long dream for all of us and enjoy every minute of your experience. Love and blessings. Shalom. Shalom and blessings to you, as well.